Can you guess this dog breed? Are you ready to test your canine capabilities? Today, we are going to show you a picture of a quite rare dog breed. Hint: you won’t likely stumble on this dog unless you live in or visit Spain. And even if you live there or decide to visit this country one day, the chances of seeing one of these pooches are quite unlikely considering that this dog breed is in danger of extinction. As you may notice, this dog breed has a distinct feature, a quite unusual nose that has a split appearance. So what dog breed is this? If you answered B, Perro de presa canaria, a large molosser-type of dog originating from the Canary Islands, this answer is incorrect. If you answered C, the Alano Español, another large, molosser-type dog originating from Spain, the answer is also incorrect. If you answered D, Carea Castellano Manchego, a dog breed originating in Castilla-La Mancha in Spain, sorry, but this answer is also incorrect. So the correct answer is A, the picture of the dog breed with a split nose is the Pachón Navarro! If you never heard about the Pachon Navarro, don’t feel bad, as mentioned, this is not a popular breed. That’s why today we thought to learn more about this breed and feature it as our Tuesday’s Dog Discovery! Also known as Navarra pointer, this Pachon Navarro is a Spanish hunting dog who boasts the peculiar feature of having a “split” or “double nose.” Some time ago, the shape of the nose was thought to give this dog a superior sense of smell, but turns out, there are really no scientific studies to back up this theory. 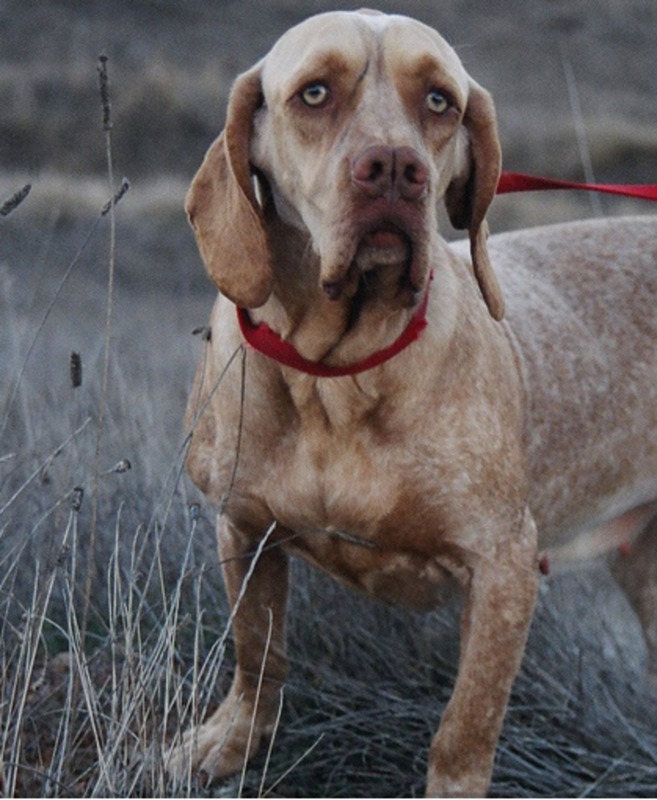 These dogs are used to hunt small game by pointing. They are used to work on any type of terrain by trotting vigorously and in close proximity to the hunter. According to the Real Sociedad Canina de Espana breed standard, this dog has a sturdy body, slightly short limbs and a big head. The nose is big and wide with open nostrils that can be “splitted” or double in some dogs. From a temperament standpoint, the Pachon Navarro is an intelligent, docile and quiet dog who tends to get along with humans and other dogs. 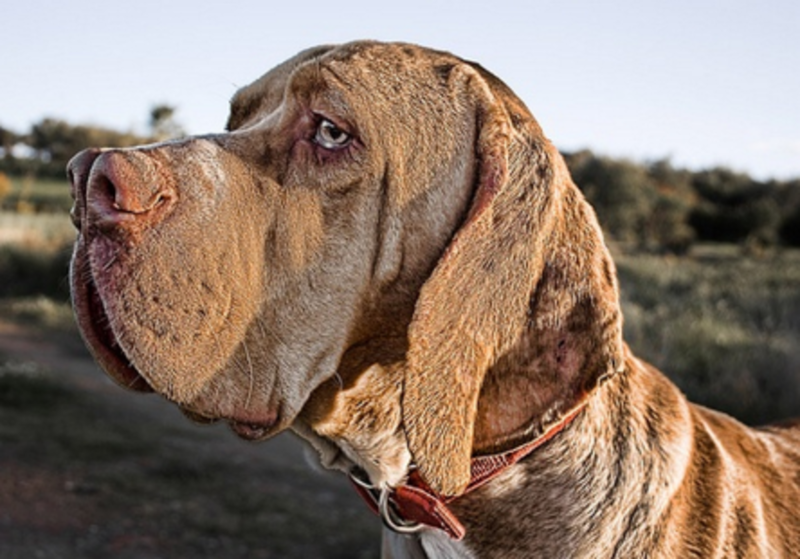 Today, there are a few other dogs known to have a distinctive split nose: the rare Catalburun of Turkey and the double-nosed Andean tiger hound, which isn’t really considered a breed, but most likely descends from the Pachon Navarro. The double nose though isn’t really what it sounds like, more than two noses, it’s simply a nose with nostrils that are split by a band of skin.